Yes its true, Karachi's Famous Zoological Garden 'The Karachi Zoo' also referred as the Gandhi Garden is now revamped and restored as it previously was in her glory days for the public of Karachi. The entrance to the Zoo was free today as the Karachi Zoo was celebrating 'The Zoo Day'. The 129 year old heritage fountain which was built in 1883 jointly by the municipality and NN Poochajee Esquire is now restored and is now sprouting water once again. The 18-foot high four-layered fountain is connected to a 11,000 gallon tank through which water keeps circulating. 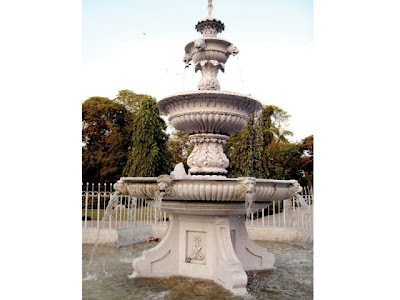 Over the years, a lack of maintenance and attention towards the fountain caused this piece of the city’s heritage to deteriorate but the Karachi Zoo's recent administration has decided to restore and reconstruct portions of the fountain which cost authorities Rs. 300,000. The Zoo Authorities have also revived Aquarium, The Reptile House, Boating (Kashti Rani) and Mumtaz Mahal facilities in addition to the fountain. These facilities were closed for the public since last 3 years and for that more than 30 species of fish and over 40 kinds of snakes and python were brought in. The inner roundabout and roads in zoo were also being redesigned and 200 rose saplings are planted in the famous Mughal Garden in Karachi Zoo which was designed after Lahore famous Shalimar Garden. The fountains at the Mughal Garden are also made functional.